This is the public profile of Boris Lutman, Additional information and high-resolution images are available for accredited press members, to access additional information about Boris Lutman please login as a press member. About Boris Lutman : LUTMAN Design is a collective of Designers, Developers and Strategists who are passionate about helping clients achieve their goals and grow their brands. The studio founded in 2005 by Boris Lutman, has developed a variety of graphic and industrial products, such as Lipko, the unique Eurobasket 2013 mascot. LUTMAN Design starts by analysing the best way to bring ideas to life in the most creative, and logical way possible. 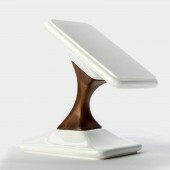 In this way, in 2014 it developed SWICH, an elegant wireless charger that immediately gained great success on the Kickstarter crowdfunding platform. SWICH represents advanced technology that was developed at the end of the 19th century by Nikola Tesla, who spent his youth also in Slovenia, in a more refined and romantic form. LUTMAN Design Studio transforms technology into high-end design accessories, with particular attention being given to materials and functionality. With a child's curiosity and accumulated experience, the studio continues to develop new products that impress for their usefulness and elegance. Design is striving for perfection. Designing unique solutions and enhance the visibility of the product on the market. Design is not only styling, is an opem minded knowledge that accompanies one product from the concept to the market. Executive MBA - General management @ MIB Business school di Trieste, Trieste, Italy. Master in Marketing & Communication @ Istituto Superiore del Marketing, Rome, Italy. Industrial design BSc @ Brunel University - West London. January 2005 - today - CEO and Designer -Design of new products and graphic design - Konteksta d.o.o. Ljubljana - LUTMAN design studio. May 2001 - December 2001 - Designer @ Philips Design, Eindhoven, Netherland. July 2014, "Uncrate", "Cool Hunting", "Trend Hunter", "Geeky Gadgets", Gizmag", "Co.Design", "The Gadgeteer", "Gigaom", "Ubergizmo", "Cool MAterial", "ZDNet", "Stuff.tv", "Highsnobiety"
Windows Office, Rhinoceros (CAD), InDesign, Premiere, Power Point, Photoshop, Illustrator. Video production, boy scouting, culinary, archery. Press Members: Request an exclusive interview with Boris Lutman.